This guide details how to leverage the notification/template engine to have eCommerce automatically send out email notifications for new orders, cases, and more. The notification/template engine is used to generate different types of templated content and is mostly used to generate personalized emails for customers regarding orders. The template engine itself is very customizable and can be completely replaced by injecting custom implementation of ITemplateService. The default implementation we provide supports XSL, (in future will support also HTML and Text) templates that are configured using eCommerce manager (administration tool). It allows creating templates using XML Stylesheet Language (XSL). This provides a very powerful and flexible way of creating notification templates for different outgoing emails. The emails can be sent using regular Smtp implementation if not hosted on windows azure, or using SendGrid implemented for azure platform. You can add username and password in there as well if your SMTP server requires authentication. The from address is optional, but will be used in EmailService implementation if no From address is passed in IEmailMessage. DefaultEmailFrom should be configured in Commerce Manager Settings tab. For more information about configuring the mail settings, see http://msdn.microsoft.com/en-us/library/w355a94k.aspx. Relevent data, including the Order object are placed in a dictionary and passed to the TemplateService.ProcessTemplate() method with the name of the template, and a CultureInfo instance representing the desired/current culture. The Process() method returns the formatted custom text. Context data can contain any number and any type objects. The important thing is that template and passed object could be processed. The following code is taken from the OrderChangeEventListener.cs that is registered as event through EntityEventInterceptor and raised after new Order entity is added. Template service renders templates using a XSL content saved in database EmailTemplates table. It expects that all the parameters passed in the dictionary context can be serialized to xml. It then looks for the specific template by template name. 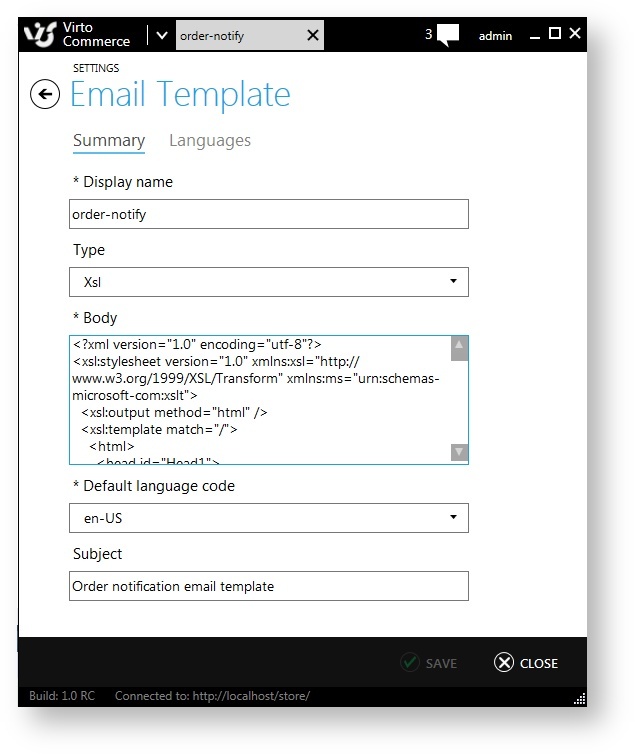 If it can't find language specific template in EmailTemplateLanguage it will use the default template.